Time Trials Flight One: 1st W26 Cory Eliason 10.244, 2nd V52 Darren Mollenoyux 10.404, 3rd V25 Jack Lee 10.415; 4th T25 Jamie Bricknell 10.453; 5th S13 Brock Hallett 10.495; 6th N53 Jessie Attard 10.511; 7th W17 James McFadden 10.532; 8th Q83 Steven Lines 10.622; 9th VA29 Jayden Peacock 10.634; 10th NS21 Jordyn Brazier 10.634; 11th V72 Jake Smith 10.755; 12th N57 Mathew Dumesny 10.772; 13th V64 David Aldersley 10.819; 14th D2 Ben Atkinson 10.834; 15th V73 Charles Hunter 10.834; 16th V53 Andrew Thompson 10.853; 17th V34 Brenten Farrer 10.921; 18th S44 Daniel Evans 10.959; 19th N49 Ian Madsen 11.033; 20th V28 Andrew Hughes 11.051; 21st S37 Terry Kelly 11.245; 22nd N83 Peter O’Neill 11.327; 23rd S72 Chad Ely 11.542. Time Trials Flight Two: 1st S19 Bradley Keller 10.158; 2nd V2 Domain Ramsay 10.166; 3rd USA12 Parker Price-Miller 10.190; 4th T22 Jock Goodyer 10.212; 5th S63 Ryan Jones 10.563; 6th V67 Luke Walker 10.432; 7th V35 Jamie Veal 10.445; 8th V40 Rusty Hickman 10.487; 9th Q23 Lachlan McHugh 10.517; 10th N36 Eddie Lumbar 10.526; 11th V8 Bobby Daly 10.542; 12th T7 Tim Hutchins 10.610; 13th VA81 Rhys Baxter 10.640; 14th V12 Kristy Ellis 10.694; 15th V44 Tim Van Ginneken 11.479; 16th V5 Max Dumesny; 17th VA6 Tim Kaeding 10.746; 18th VA88 Grant Stansfield 10.854; 19th N40 Chris McInerney 10.994; 20th V50 Darren Clarke 10.941; 21st N10 Luke Stirton 11.030; 22nd V89 Jamie Heyen 11.115; 23rd VA19 Daniel Newnham 11.141; 24th N16 Daniel Sayre 11.192. Heat One: 1st W26 Cory Eliason; 2nd V25 Jack Lee; 3rd W17 James McFadden; 4th S13 Brock Hallett; 5th V72 Jacob Smith; 6th V64 David Aldersley; 7th V73 Charles Hunter; 8th V34 Brenten Farrer; 9th VA29 Jayden Peacock; 10th S37 Terry Kelly. Heat Two: 1st V52 Darren Mollenoyux; 2nd T25 Jamie Bricknell; 3rd Q83 Steven Lines; 4th N53 Jessie Attard; 5th NS21 Jordyn Brazier; 6th D2 Ben Atkinson; 7th N57 Matthew Dumesny; 8th V28 Andrew Hughes; 9th S44 Daniel Evans; 10th N83 Peter O’Neill; 11th V53 Andrew Thompson. Heat Three: 1st S19 Brad Keller; 2nd USA12 Parker Price-Miller; 3rd V35 Jamie Veal; 4th S63 Ryan Jones; 5th Q23 Lachlan McHugh; 6th V44 Tim Van Ginneken; 7th VA6 Tim Kaeding; 8th VA81 Rhys Baxter; 9th V8 Bobby Daly; 10th N40 Chris McInerney; 11th N10 Luke Stirton. Heat Four: 1st V2 Domain Ramsay; 2nd T22 Jock Goodyer; 3rd V67 Luke Walker; 4th T7 Tim Hutchins; 5th VA88 Grant Stansfield; 6th V5 Max Dumesny; 7th V40 Rusty Hickman; 8th V89 Jamie Heyen; 9th V50 Darren Clarke; 10th N36 Eddie Lumbar; 11th V12 Kristy Ellis; 12th N16 Daniel Sayre. Heat Five: 1st Q83 Steven Lines; 2nd T25 Jamie Bricknell; 3rd N57 Mathew Dumesny; 4th V34 Brenten Farrer; 5th W26 Cory Eliason; 6th S13 Brock Hallett; 7th V28 Andrew Hughes; 8th V64 David Aldersley; 9th VA29 Jayden Peacock; 10th V53 Andrew Thompson; 11th S37 Terry Kelly. Heat Six: 1st W17 James McFadden; 2nd N49 Ian Madsen; 3rd V73 Charles Hunter; 4th D2 Ben Atkinson; 5th N53 Jessie Attard; 6th V52 Darren Mollenoyux; 7th V25 Jack Lee; 8th S44 Daniel Evans; 9th V72 Jacob Smith ; 10th N83 Peter O’Neill; 11th NS21 Jordyn Brazier. Heat Seven: 1st VA6 Tim Kaeding; 2nd Q23 Lachlan McHugh; 3rd S63 Ryan Jones; 4th N10 Luke Stirton; 5th V40 Rusty Hickman; 6th V5 Max Dumesny; 7th T22 Jock Goodyer; 8th T7 Tim Hutchins; 9th S19 Brad Keller; 10th V50 Darren Clarke; 11th VA81 Rhys Baxter. Heat Eight: 1st V44 Tim Van Ginneken; 2nd VA88 Grant Stansfield; 3rd V67 Luke Walker; 4th V35 Jamie Veal; 5th V8 Bobby Daly; 6th USA12 Parker Price-Miller; 7th N40 Chris McInerney; 8th VA19 Daniel Newnham; 9th V12 Kristy Ellis; 10th N36 Eddie Lumbar; 11th V2 Domain Ramsay; V89 Jamie Heyen. Sprintcar C-Main (15 Laps 4 Transfer to B-Main): 1st NS4 Max Johnston; 2nd N57 Mathew Dumesny; 3rd V44 Tim van Ginneken; 4th VA81 Rhys Baxter; 5th N43 Alex Orr; 6th T22 Jock Goodyer. Sprintcar B-Main (20 Laps 4 Transfer to A-Main): 1st V34 Brenten Farrer; 2nd V73 Charles Hunter; 3rd N49 Ian Madsen; 4th T7 Tim Hutchins; 5th V5 Max Dumesny; 6th V8 Bobby Daly; 7th N10 Luke Stirton; 8th VA81 Rhys Baxter; 9th S44 Daniel Evans; 10th V28 Andrew Hughes; 11th N40 Chris McInerney; 12th N83 Peter O’Neil; 13th V50 Darren Clarke; 14th V12 Kristy Ellis; 15th V53 Andrew Thompson; 16th V72 Jacob Smith; 17th NS21 Jordyn Brazier; 18th V64 David Aldersley; 19th V40 Rusty Hickman; 20th VA29 Jayden Peacock. 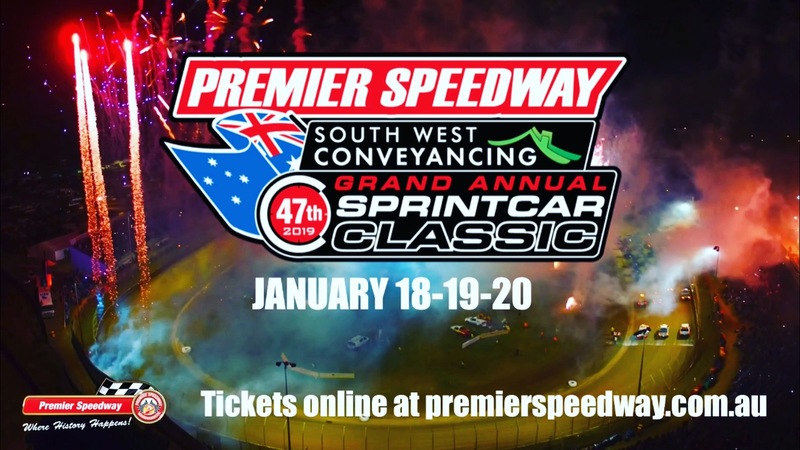 Sprintcar A-Main (30 laps No Time): 1st V35 Jamie Veal; 2nd S63 Ryan Jones; 3rd V67 Luke Walker; 4th W26 Cory Eliason; 5th USA12 Parker Price-Miller; 6th Q23 Lachlan McHugh; 7th VA6 Tim Kaeding; 8th T25 Jamie Bricknell; 9th S13 Brock Hallett; 10th V25 Jack Lee; 11th V34 Brenten Farrer; 12th VA88 Grant Stansfield; 13th T7 Tim Hutchins; 14th N57 Mathew Dumesny; 15th S19 Brad Keller; 16th V44 Tim Van Ginneken; 17th N49 Ian Madsen; 18th W17 James McFadden; 19th V73 Charles Hunter; 20th Q83 Steven Lines; 21st T22 Jock Goodyer; 22nd N53 Jessie Attard; 23rd V52 Darren Mollenoyux; 24th D2 Ben Atkinson. (Start Order: 1. T25; 2. V67; 3. W17; 4. S63; 5. Q83; 6. V35; 7. W26; 8. USA12; 9. V52; 10. Q23; 11. V25; 12. V44; 13. N53; 14. T22; 15. S13; 16. VA88; 17. N57; 18. S19; 19. D2; 20. VA6; 21. V34; 22. V73; 23. N49; 24. T7. Lap Leaders: 1-3 T25 Jamie Bricknell; 4-12 W17 James McFadden; 13-30 V35 Jamie Veal. Heat One: 1st W92 Quentin Tanner; 2nd W88 Howard Stansfield; 3rd W84 Paul Verhoeven. Heat Two: 1st W98 Ewan McKenzie; 2nd S53 Peter Duynhoven; 3rd W21 Troy Gleeson. A-Main: W98 Ewan McKenzie; 2. W92 Quentin Tanner; 3. W21 Troy Gleeson; 4. W84 Paul Verhoeven; 5. W88Howard Stansfield; 6. W8 Jamie May; 7. M57 Troy Hose; 8. S66 George Woolstencroft; 9. S95 David Duynhoven; 10. S53 Peter Duynhoven; 11. M85 Paul Singleton.